As well as adhering to the safe limit for gluten intake, a suitable gluten-free (GF) diet must also be nutritionally balanced. However, malnutrition has been observed in the population with celiac disease (CD). This is even more important in the case of children and adolescents, whose GF diet must also ensure their proper growth. The aim of the present study was to assess the diet quality of children and adolescents with CD to attain optimal nutritional status, determining the most relevant factors that affect a balanced diet. Eighty-three children and adolescents with CD (9.2 ± 3.8 years) took part in the study. Height, weight and body composition were measured. An analysis of energy consumption and of the macronutrient distribution of their diet was carried out. 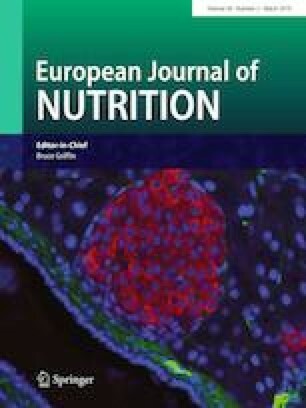 Adherence to Mediterranean diet by KIDMED index was analyzed, and energy and nutrients intake. The diet of participants was not balanced, containing more fat and less carbohydrate than recommended. Most children and adolescents revealed adequate body mass index and suitable body fat percentage. Two-thirds of them showed moderate or poor KIDMED index, the case of girls being remarkable. When the GF diet, containing GF-rendered foodstuffs, was compared to a similar type of diet but substituting GF products with their analogs containing gluten, important nutritional differences were revealed. Even though celiac children and adolescents’ diet is unhealthy due to its inappropriate dietary pattern, following a diet based on GF products raises extra difficulty in complying with the nutritional recommendations. The online version of this article ( https://doi.org/10.1007/s00394-018-1685-2) contains supplementary material, which is available to authorized users. This research was supported by grants from the University of the Basque Country (University-Society US12/10 and US15/06) and a grant from the Basque Government (Proyectos de Investigación Focalizada Agricultura PA15/01). Idoia Larretxi is a PhD scholar of the University of the Basque Country, UPV/EHU (Euskararen eta Etengabeko Prestakuntzaren arloko Errektoreordetza). We thank the collaboration of Hospital Universitario Donostia and “Federación Española de Asociaciones de Celiacos” (FACE), specifically that of Mireia Apraiz (EZE). IL and MAB performed the anthropometric measurements and collected questionnaires. FJE and LB recruited the patients, performed anthropometric measurements and collected questionnaires. IC and ES carried out the experimental design and analyzed data. JM and AL wrote the manuscript.